The notorious conflict between the Hatfield and the McCoy families of West Virginia and Kentucky is often remembered as America's most famous feud, but it was relatively brief and subdued compared to the violence in Breathitt County, Kentucky. From the Reconstruction period until the early 20th century, Breathitt's 500 square miles of rugged upcountry land was known as "the darkest and bloodiest of all the dark and bloody feud counties" due to its considerable number of homicides, which were not always related to the factional conflicts that swept the region. 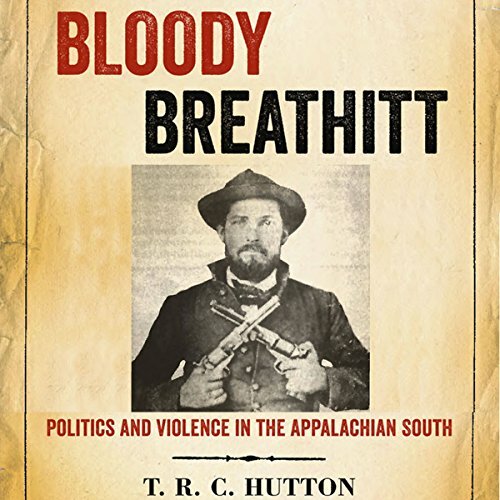 In Bloody Breathitt, T. R. C. Hutton carefully investigates instances of individual and mass violence in the county from the Civil War through the Progressive era, exploring links between specific incidents and broader national and regional events. Hutton explains how their causes and implications often reflected distinctly political intentions. By framing the incidents as "feuds," those in positions of authority disguised politically motivated murders by placing them in a fictive past, preventing outsiders from understanding the complex reality. Hutton's timely study reminds listeners that the nation's political stability has had a tremendous cost in terms of bloodshed. Winner of the Weatherford Award for nonfiction. Winner of the Appalachian Writers Association Book of the Year for nonfiction. The book is published by The University Press of Kentucky.